↑ Computed from period, using the IAU-MPC NSES µ value. ↑ Pluto Project pseudo-MPEC for Saturn VII Archived 2006-05-29 at the Wayback Machine. 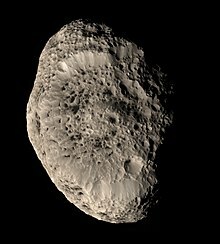 ↑ NASA's Solar System Exploration: Saturn: Moons: Hyperion: Facts & Figures Archived 2004-11-03 at the Wayback Machine. ↑ ၄.၀ ၄.၁ ၄.၂ ၄.၃ "Sizes, shapes, and derived properties of the saturnian satellites after the Cassini nominal mission" (July 2010). Icarus 208 (1): 395–401. doi:10.1016/j.icarus.2010.01.025. Bibcode: 2010Icar..208..395T. ↑ "Hyperion's Sponge-like Appearance" (2007). Nature 448 (7149): 50–56. doi:10.1038/nature05779. PMID 17611535. Bibcode: 2007Natur.448...50T.